Posted on August 12, 2014 September 20, 2017 by Marty Schoenleber, Jr.
To those who think the Bible makes no difference: a note from history. 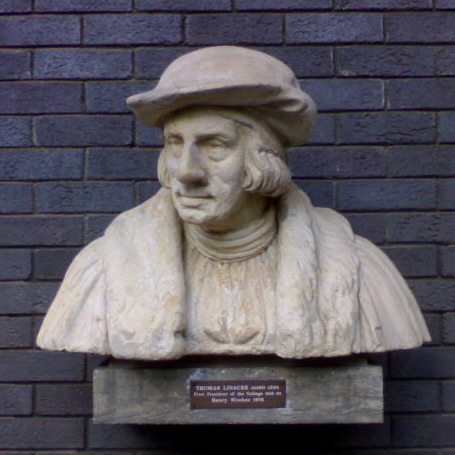 Thomas Linacre (pronounced, “Lynaker”) was a British humanist and physician. During his own time, he was known more for his fluency in Latin and Greek than he was for anything else. Having studied Greek in Italy, he brought a scholars diligence to the task of translation of classical works, especially works bearing on medicine. But he was after all a physician with patients such as Erasmus and Cardinal Wolsey, the Archbishop William Warham and even the King of England. Part of his lasting legacy came as a result of his outrage over barbers, clergyman, and even butchers practicing medicine without any training. He was instrumental in starting the Royal College of Physicians which continues today and raised a higher standard for medical practice. At the age of 60, Linacre left medical practice altogether and was ordained a Roman Catholic priest. He was to live only four more years but note well his dates, (c. 1460–1524). Think about what was happening during his lifetime. the whole continent is abuzz with excitement and upheaval. In this context, Linacre begins to study recently discovered copies of the Greek New Testament. He is a scholar. He was Erasmus’ tutor. He is fluent and known as a Greek master and now, near the end of his life, he reads for the first time, not the rituals of the Mass, not the ecclesial letters of his bishop or Pope. He reads the four Gospels and the epistles of Paul, and John, and Peter for the first time. What does he think of them? Such is the power of THE BOOK. It cuts through all of the encrustments of culture and time and penetrates the heart. Christian: Read your Bible. Read it often. Read it thoughtfully. Read it when you don’t want to. Read it and let it change you. Sceptic: Pick up a Bible and read with the eyes of a learner. Perhaps you too will join the happy band who know it to be the Word of the Living God.